Profile Manager first appeared in OS X Lion Server as the Apple-provided tool for managing Apple devices, including Mobile Device Management (MDM) for iOS based devices as well as Profile management for OS X based computers, including MacBooks, MacBook Airs, Mac Minis, Mac Pros and iMacs running Mac OS X 10.7 and up. 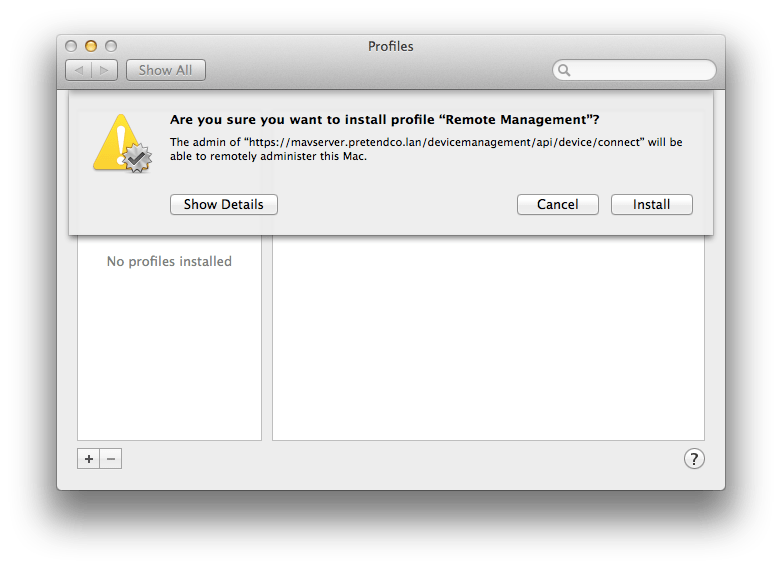 In OS X Mountain Lion, Apple added a number of new features to Profile Manager and revved the software to Profile Manager 2.0, most notably adding the ability to push certain types of apps to mobile devices. In Mavericks Server (Server 3), Apple provides new options and streamlines a bunch of things, most notably App Store and VPP integration. But we can talk about this stuff all day long, instead let’s just show ya’! Preparing For Profile Manager Before we get started, let’s prep the system for the service. This starts with configuring a static IP address and properly configuring a host name for the server. In this example, the IP address will be 192.168.210.135 and the hostname will be mlserver3.pretendco.com. We’ll also be using a self-signed certificate, although it’s easy enough to generate a CSR and install it ahead of time. For the purposes of this example, we have installed Server from the App Store (and done nothing else with Server except open it the first time so it downloads all of its components from the web) and configured the static IP address using the Network System Preferences. Next, we’ll set the hostname using scutil. sudo scutil --set HostName mavserver.pretendco.lan Then the ComputerName: sudo scutil --set ComputerName mavserver.pretendco.lan And finally, the LocalHostName: sudo scutil --set LocalHostName mdm Now check changeip: sudo changeip -checkhostname The changeip command should output something similar to the following: Primary address = 192.168.210.201 Current HostName = mavserver.pretendco.lan DNS HostName = mavserver.pretendco.lan The names match. There is nothing to change. dirserv:success = "success" f you don’t see the success and that the names match, you might have some DNS work to do next, according to whether you will be hosting DNS on this server as well. If you will be hosting your own DNS on the Profile Manager server, then the server’s DNS setting should be set to the IP address of the Server. To manage DNS, start the DNS service and configure as shown in the DNS article I did previously: Provided your DNS is configured properly then changeip should work. If you’re hosting DNS on an Active Directory integrated DNS server or some other box then just make sure you have a forward and reverse record for the hostname/IP in question. 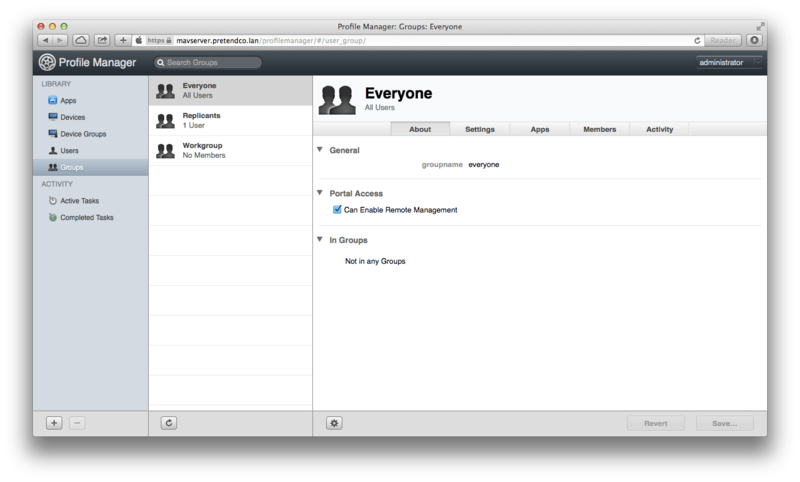 Profile Manager is built atop the web service, APNS and Open Directory. Next, click on the Web service and just hit start. While not required for Profile Manager to function, it can be helpful. We’re not going to configure anything else with this service in this article so as not to accidentally break Profile Manager. Do not click on anything while waiting for the service to start. While the indicator light can go away early, note that the Web service isn’t fully started until the path to the default websites is shown (the correct entry, as seen here, should be /Library/Server/Web/Data/Sites/Default) and a View Server Website link is shown at the bottom of the screen. If you touch anything too early then you’re gonna’ mess something up, so while I know it’s difficult to do so, be patient (honestly, it takes less than a minute, wait for it, wait for it, there!). 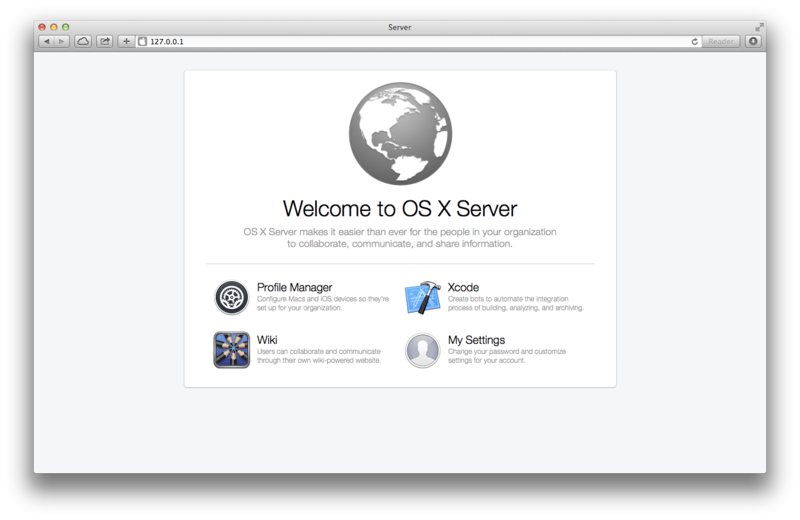 Once the Web service is started and good, click on the View Server Web Site link at the bottom and verify that the Welcome to OS X Server page loads. Setting Up Profile Manager Provided the Welcome to OS X Server page loads, click on the Profile Manager service. Here, click on the Configure button. 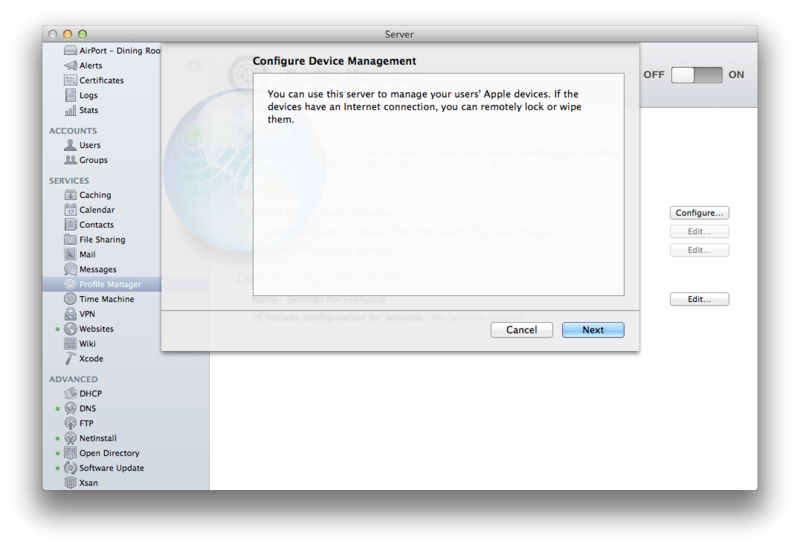 At the first screen of the Configure Device Management assistant, click on Next. Assuming the computer is not yet an Open Directory master or Replica, and assuming you wish to setup a new Open Directory Master, click on Create a new Open Directory domain at the Configure Network Users and Groups screen. Then click on Next. At the Directory Administrator screen, provide the username and password you’d like the Open Directory administrative account to have (note, this is going to be an Open Directory Master, so this example diradmin account will be used to authenticate to Workgroup Manager if we want to make changes to the Open Directory users, groups, computers or computer groups from there). Once you’re done entering the correct information, click Next. At the Organization Information screen, enter your information (e.g. name of Organization and administrator’s email address). Keep in mind that this information will be in your certificate (and your CSR if you submit that for a non-self-signed certificate) that is used to protect both Profile Manager and Open Directory communications. Click Next. At the Confirm Settings screen, make sure the information that will be used to configure Open Directory is setup correctly. Then click Set Up (as I’ve put a nifty red circle next to – although it probably doesn’t help you find it if it’s the only button, right?). 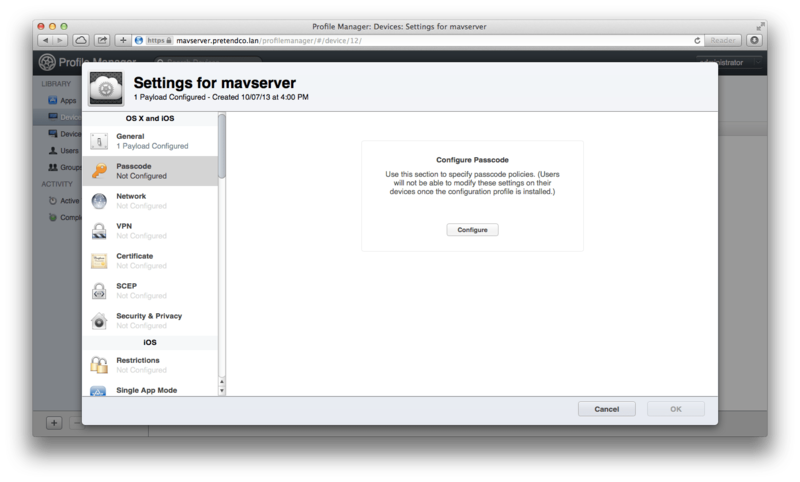 The Open Directory master is then created. 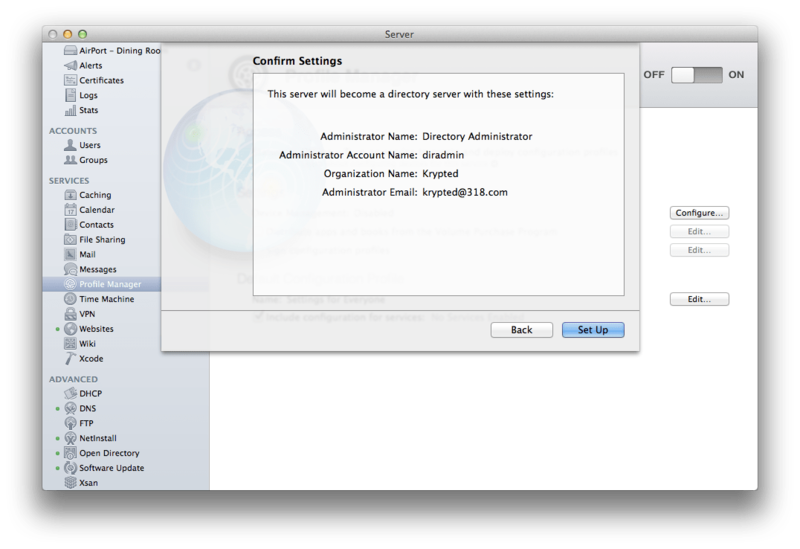 At the Organization Information screen, enter the name of the contact information for an administrator and click on the Next button. Even if you’re tying this thing into something like Active Directory, this is going to be a necessary step. Once Open Directory is setup you will be prompted to provide an SSL Certificate. This can be the certificate provided when Open Directory is initially configured, which is self-signed, or you can select a certificate that you have installed using a CSR from a 3rd party provider. At this point, if you’re using a 3rd party Code Signing certificate you will want to have installed it as well. Choose a certificate from the Certificate: drop-down list and then click on Next. If using a self-signed certificate you will be prompted that the certificate isn’t signed by a 3rd party. Click Next if this is satisfactory. You will then be prompted to enter the credentials for an Apple Push Notification Service (APNS) certificate. This can be any valid AppleID. 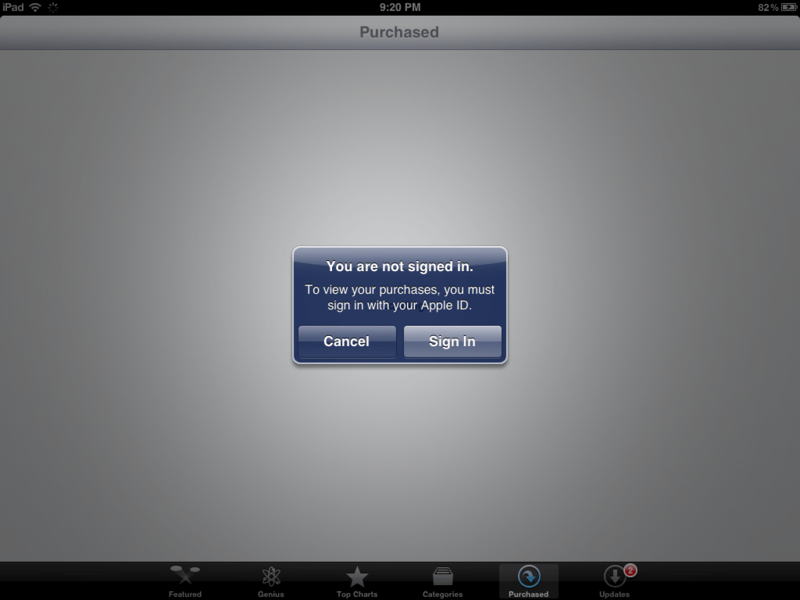 It is best to use an institutional AppleID (e.g. push@krypted.com) rather than a private one (e.g. charles@krypted.com). Once you have entered a valid AppleID username and password, click Next. Provided everything is working, you’ll then be prompted that the system meets the Profile Manager requirements. Click on the Finish button to complete the assistant. When the assistant closes, you will be back at the Profile Manager screen in the Server application. Here, check the box for Sign Configuration Profiles. The Code Signing Certificate screen then appears. Here, choose the certificate from the Certificate field. Unless you’re using a 3rd party certificate there should only be one certificate in the list. Choose it and then click on OK. If you are using a 3rd party certificate then you can import it here, using the Import… selection. If you host all of your services on the one server (Mail, Calendars, VPN, etc) then leave the box checked for Include configuration for services; otherwise uncheck it. One of the upgrades in Profile Manager 2.2 is the ability to distribute objects from the App Store Volume Purchase Program through Profile Manager. To use this option, first sign up on the VPP site. Once done, you will receive a token file. Using the token file, check the box for “Distribute apps and books from the Volume Purchase Program” and then use the Choose button to select the token file. Now that everything you need is in place, click on the ON button to start the service and wait for it to finish starting (happens pretty quickly). Once started, click on the Open Profile Manager link and the login page opens. Administrators can login to Profile Manager to setup profiles and manage devices. 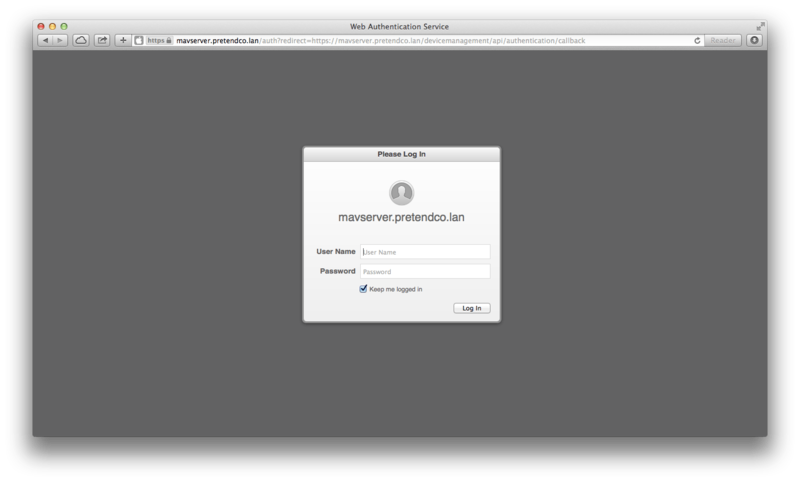 The URL for this (for mavserver.pretendco.lan) is https://mavserver.pretendco.lan/profilemanager. Use the Everyone profile to automatically configure profiles for services installed on the server if you want them deployed to all users. Use custom created profiles for everything else. 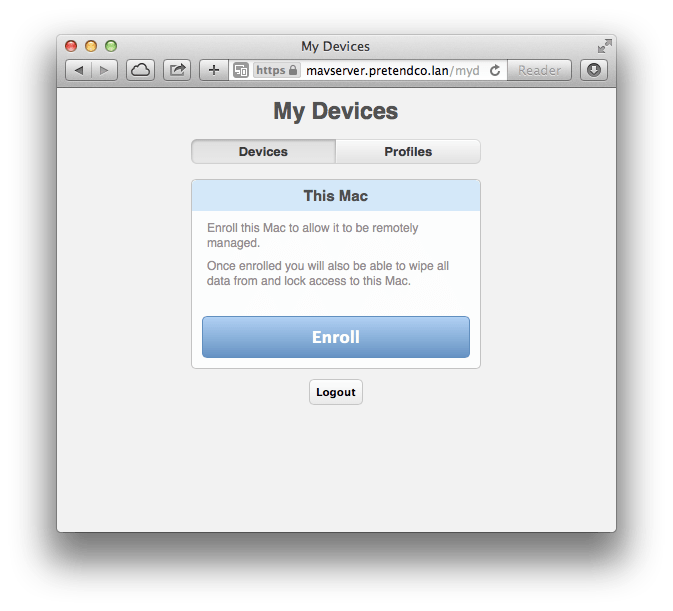 Enrolling Into Profile Manager To enroll devices for management, use the URL https://mavserver.pretendco.lan/MyDevices (replacing the hostname with your own). Click on the Profiles tab to bring up a list of profiles that can be installed manually. From Profiles, click or tap the Enroll button. The profile is downloaded and when prompted to install the profile, click Continue. Then click Install if installing using a certificate not already trusted. Once enrolled, click on the Profile in the Profiles System Preference pane to see the settings being deployed. 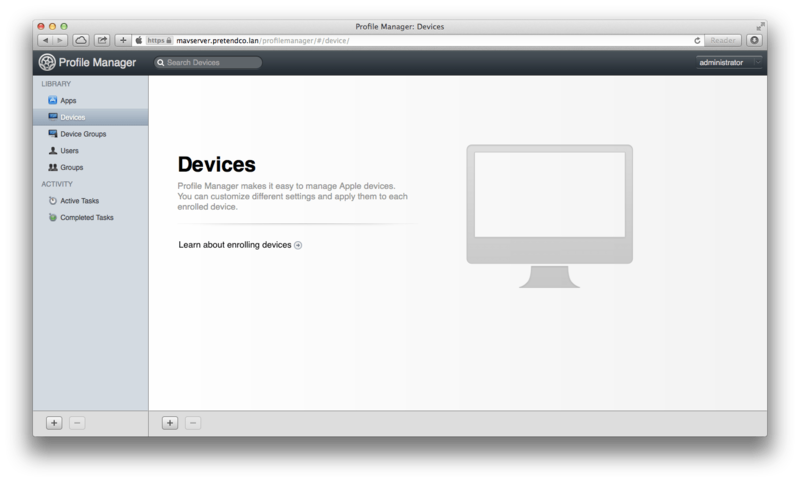 You can then wipe or lock the device from the My Devices portal. 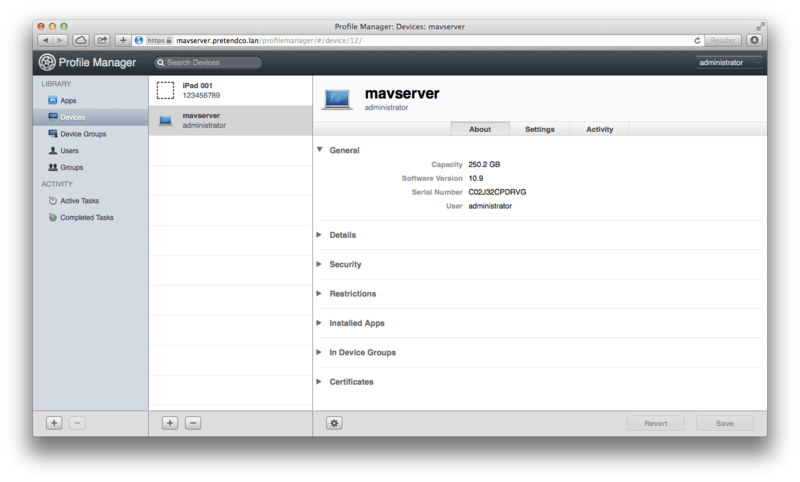 Management profiles from the MDM server are then used. Devices can opt out from management at any time. 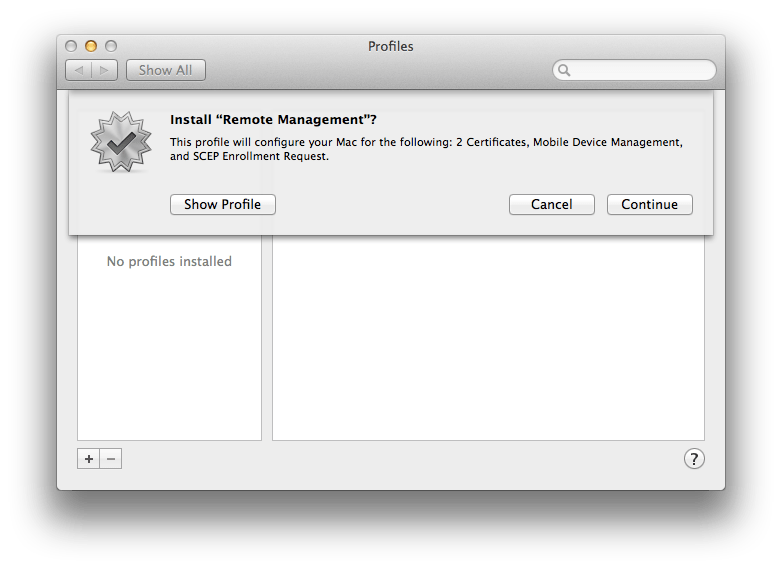 If you’re looking for more information on moving Managed Preferences (MCX) from Open Directory to a profile-based policy management environment, review this article and note that there are new options in dscl for removing all managed preferences and working with profiles in Mavericks (10.9). If there are any problems when you’re first getting started, an option is always to run the wipeDB.sh script that resets the Profile Manager (aka, devicemgr) database. This can be done by running the following command: sudo /Applications/Server.app/Contents/ServerRoot/usr/share/devicemgr/backend/wipeDB.sh Automating Enrollment & Random Management Tips The two profiles needed to setup a client on the server are accessible from the web interface of the Server app. Saving these two profiles to a Mac OS X computer then allows you to automatically enroll devices into Profile Manager using Apple Configurator, as shown in this previous article. When setting up profiles, note that the username and other objects that are dynamically populated can be replaced through a form of variable expansion using payload variables in Profile Manager. For more on doing so, see this article. Note: As the database hasn’t really changed, see this article for more information on backing up and reindexing the Profile Manager database. Device Management Once you’ve got devices enrolled, those devices can easily be managed from a central location. The first thing we’re going to do is force a passcode on a device. Click on Devices in the Profile Manager sidebar. 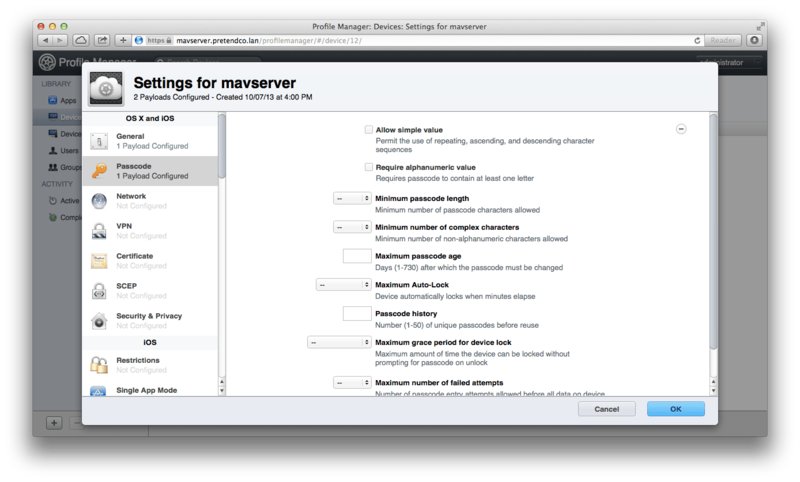 Click on a device in Profile Manager’s admin portal, located at https://<SERVERNAME>/profilemanager (in this case https://mavserver.pretendco.lan/profilemanager). The device screen is where much of the management of each device is handled. From the device (or user, group, user group or device group objects), click on the Settings tab and then click on the Edit button. Here, you can configure a number of settings on devices. There are sections for iOS specific devices, OS X specific settings and those applicable to both platforms. 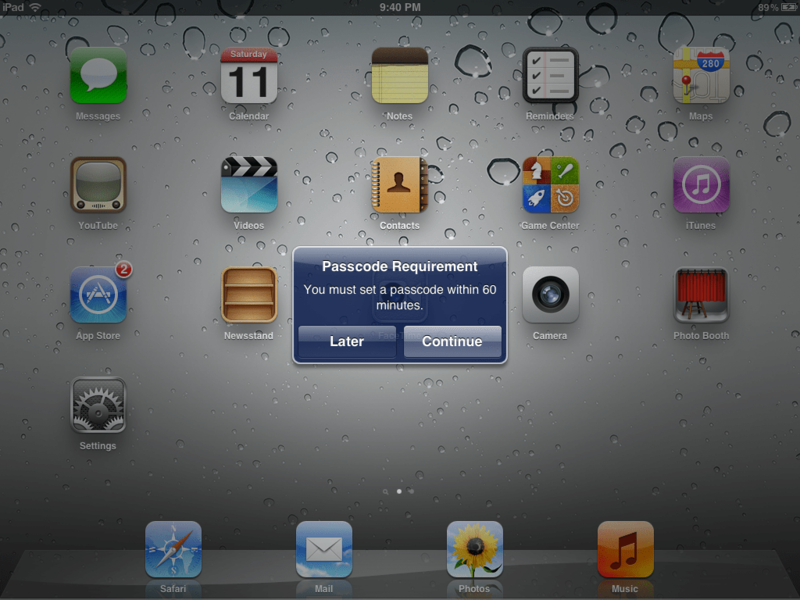 Let’s configure a passcode requirement for an iPad. Click on Passcode, then click on Configure. At the Passcode settings, let’s check the box for Allow simple value and then set the Minimum Passcode Length to 4. I find that with iOS, 4 characters is usually enough as it’ll wipe far before someone can brute force that. Click OK to commit the changes. Once configured, click Save. At the “Save Changes?” screen, click Save. 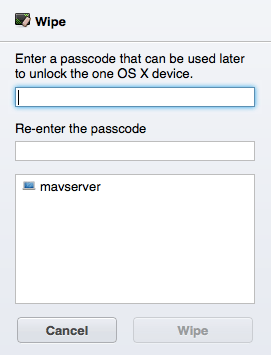 The device then prompts you to set a passcode a few moments later (screens look the same in iOS 7 pretty much). The next thing we’re going to do is push an app. To do so, first find an app in your library that you want to push out. Right-click (or control-click) on the app and click on Show in Finder. You can install an Enterprise App from your library or browse to it using the VPP program if the app is on the store. Before you start configuring apps, click on the Apps entry in the Profile Manager sidebar. At the Apps screen, use the Enterprise App entry to select an app or use the Volume Purchase Program button to open the VPP and purchase an app. Then, from the https://<SERVERNAME>/profilemanager portal, click on an object to manage (in this case it’s a group called Replicants) and click on the Apps tab. From the Apps tab, click on the plus sign icon (“+”). At the Add Apps screen, choose the app added earlier and then authenticate if needed, ultimately selecting the app. The app is then uploaded and displayed in the list. Click Add to add to the selected group. Then, click on Done. 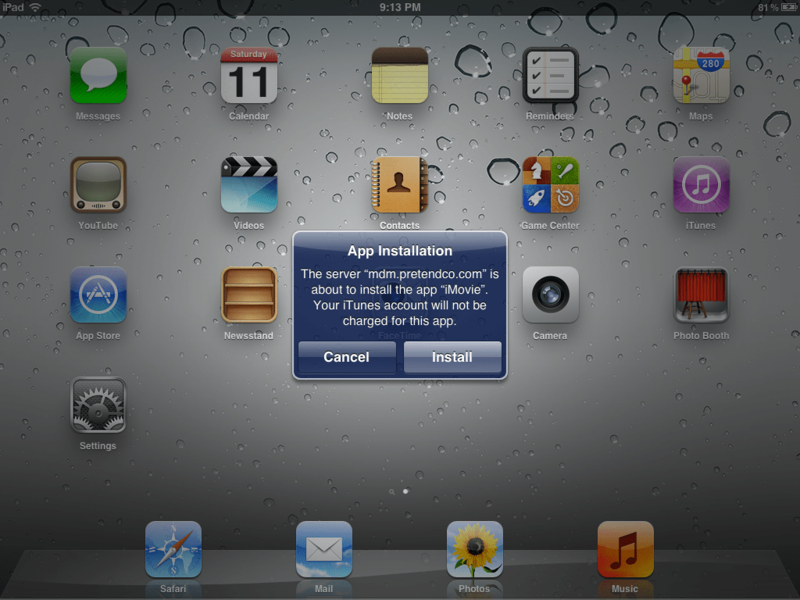 Then click on Save… and an App Installation dialog will appear on the iOS device you’re pushing the app to. At the App Installation screen on the iPad, click on the Install button and the app will instantly be copied to the last screen of apps on the device. Tap on the app to open it and verify it works. Assuming it does open then it’s safe to assume that you’ve run the App Store app logged in as a user who happens to own the app. You can sign out of the App Store and the app will still open. However, you won’t be able to update the app as can be seen here. Note: If you push an app to a device and the user taps on the app and the screen goes black then make sure the app is owned by the AppleID signed into the device. If it is, have the user open App Store and update any other app and see if the app then opens. Finally, let’s wipe a device. From the Profile Manager web interface, click on a device and then from the cog wheel icon at the bottom of the screen, select wipe. At the Wipe screen, click on the device and then click Wipe. When prompted, click on the Wipe button again, entering a passcode to be used to unlock the device if possible. The iPad then says Resetting iPad and just like that, the technical walkthrough is over. Note: For fun, you can use the MyDevices portal to wipe your iPad from the iPad itself. 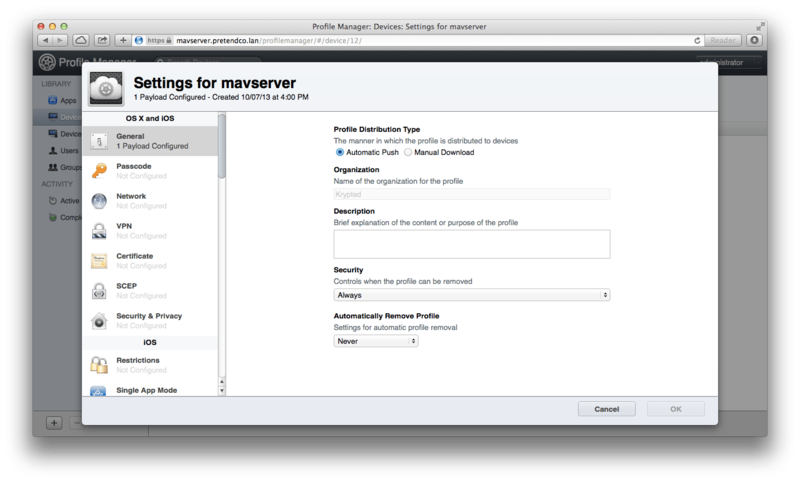 Profile Manager simplifies deploying, configuring, and managing them all. It’s one place where you control everything: You can create profiles to set up user accounts for mail, calendar, contacts, and messages; configure system settings; enforce restrictions; set PIN and password policies; and more. Because it’s integrated with the Apple Push Notification service, Profile Manager can send out updated configurations over the air, automatically. And it includes web-based administration, so you can manage your server from any modern web browser. 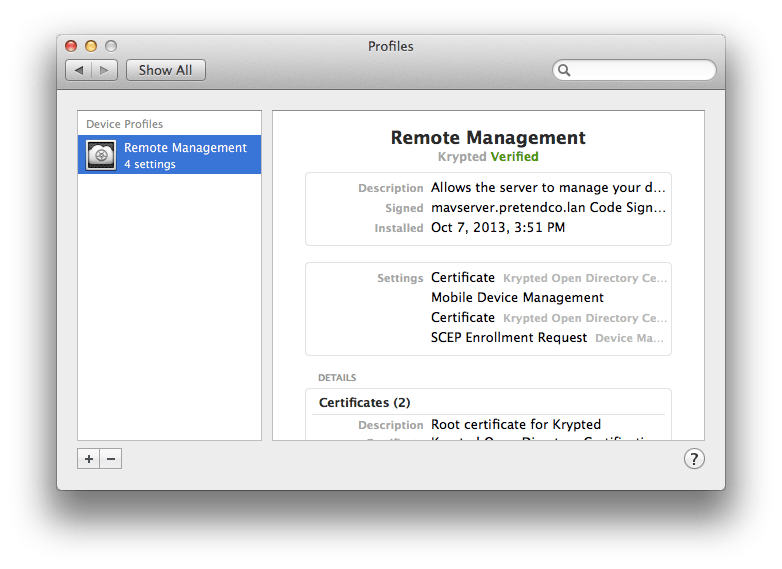 Profile Manager even gives users access to a self-service web portal where they can download and install new configuration profiles, as well as clear passcodes and remotely lock or wipe their Mac, iPhone, or iPad if it’s lost or stolen. Wait, it did that before… Which isn’t to say that for the money, Profile Manager isn’t an awesome tool. Apps such as Casper MDM, AirWatch, Zenprise, MaaS360, etc all have far more options, but aren’t as easy to install and nor do they come at such a low price point. Profile Manager is a great option if all of the tasks you need to perform are available within the tool. If not, then it’s worth a look, if only as a means to learn more about the third party tools you’ll ultimately end up using. One thing I can say for it is that Profile Manager is a little faster and seems much more stable (in fact, Apple has now published scalability numbers, which they have rarely done in the past). 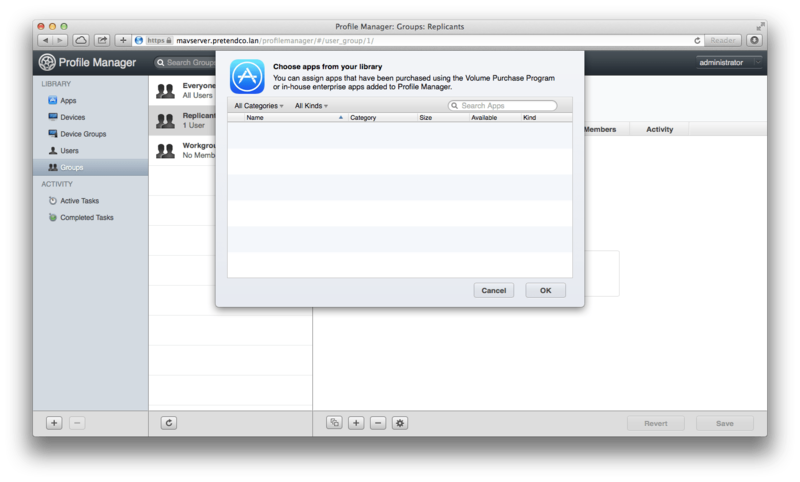 You can also implement newer features with it, including Gatekeeper and Messages.